This example solves a map-coloring problem to demonstrate using Ocean tools to solve a problem on a D-Wave system. It demonstrates using the D-Wave system to solve a more complex constraint satisfaction problem (CSP) than that solved in the example of Constrained Scheduling. Constraint satisfaction problems require that all a problem’s variables be assigned values, out of a finite domain, that result in the satisfying of all constraints. The map-coloring CSP, for example, is to assign a color to each region of a map such that any two regions sharing a border have different colors. Coloring a map of Canada with four colors. Each region is assigned one color only, of \(C\) possible colors. The color assigned to one region cannot be assigned to adjacent regions. Ocean tools dwavebinarycsp and dwave-system. For graphics, you will also need NetworkX. Following the standard solution process described in Section Solving Problems on a D-Wave System, we (1) formulate the problem as a binary quadratic model (BQM) by using unary encoding to represent the \(C\) colors: each region is represented by \(C\) variables, one for each possible color, which is set to value \(1\) if selected, while the remaining \(C-1\) variables are \(0\). (2) Solve the BQM with a D-Wave system as the sampler. Formulate the problem as a graph, with provinces represented as nodes and shared borders as edges, using 4 binary variables (one per color) for each province. Create a binary constraint satisfaction problem and add all the needed constraints. Convert to a binary quadratic model. You can skip directly to the complete code for the problem here: Map Coloring: Full Code. The example uses the D-Wave binary CSP tool to set up constraints and convert the CSP to a binary quadratic model, dwave-system to set up a D-Wave system as the sampler, and NetworkX to plot results. 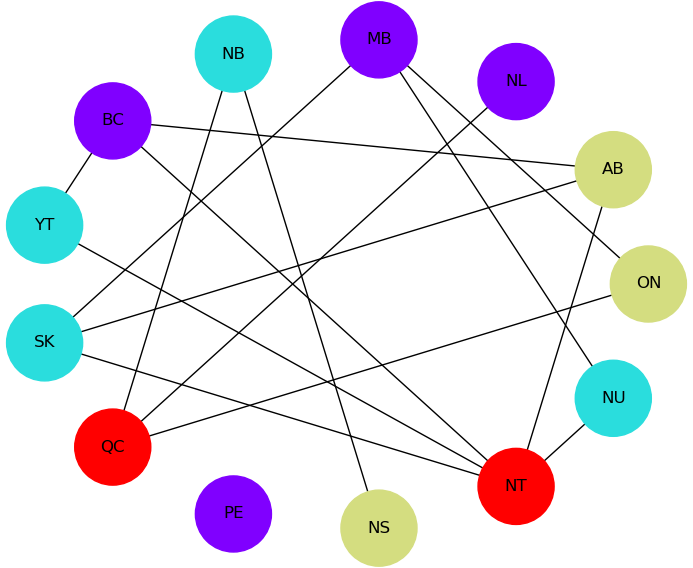 Start by formulating the problem as a graph of the map with provinces as nodes and shared borders between provinces as edges (e.g., “(‘AB’, ‘BC’)” is an edge representing the shared border between British Columbia and Alberta). csp.add_constraint(not_both_1, variables) represents the constraint that two nodes (provinces) with a shared edge (border) not both select the same color. Convert the CSP into a binary quadratic model so it can be solved on the D-Wave system. The next code sets up a D-Wave system as the sampler and requests 50 samples. In the code below, replace sampler parameters as needed. If you configured a default solver, as described in Using a D-Wave System, you should be able to set the sampler without parameters as sampler = EmbeddingComposite(DWaveSampler()). You can see this information by running dwave config inspect in your terminal. The next code requires Matplotlib. The plot shows a solution returned by the D-Wave solver. No provinces sharing a border have the same color. 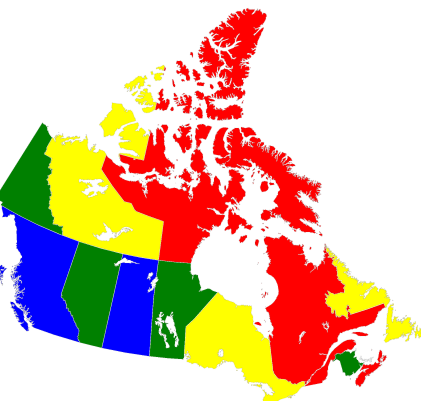 Solution for a map of Canada with four colors. The graph comprises 13 nodes representing provinces connected by edges representing shared borders. No two nodes connected by an edge share a color. You can copy the complete code for the problem here: Map Coloring: Full Code.